Prime Minister Theresa May takes questions during a press conference at 10 Downing Street, London, to discuss her Brexit plans. Amber Rudd Is the new work and pensions secretary, and Stephen Barclay the new Brexit secretary, after a tumultuous few days in Westminster. Theresa May doubled down on her EU withdrawal agreement after a day of cabinet resignations on Thursday, but Westminster is waiting to hear whether she'll face a no confidence vote. Environment secretary Michael Gove decided to stay in the cabinet. He rejected May's offer to become Brexit secretary after she told him he would not be able to go back to Brussels to renegotiate aspects of the deal. Brexit secretary Dominic Raab resigned hours after she won cabinet backing for a withdrawal agreement brokered with the EU. Work and pensions secretary Esther McVey also resigned, accusing Theresa of not honouring promises made to voters, along with several junior ministers. Eurosceptic Jacob Rees-Mogg is among the Tory MPs who have sent a letter withdrawing support for Theresa May's leadership – 48 no-confidence letters would trigger a vote. But Theresa May defended the agreement as the only way to achieve Brexit and has vowed to stay and said she is "determined to see this through." The leader of the House of Commons has said that the prime minister’s draft EU withdrawal agreement needs to be worked on before it is signed off at a meeting of EU leaders on Nov. 25. Leadsom already told friends after the crunch cabinet meeting this week that she did not support key aspects of the deal, BuzzFeed News reported on Saturday. An ally said that she felt she would be unable to introduce the meaningful vote to parliament in her role as Commons leader unless changes are made to the deal. They said she could resign ahead of the vote. She is convening a meeting with Michael Gove, Liam Fox, Penny Mordaunt, and Chris Grayling to “rewrite” the agreement. Other Brexiteers dismissed the meeting as an attempt to save face, noting that May has already ruled out any further changes. Theresa May made two new appointments to her cabinet on Friday, bringing in a relatively unknown junior minister to replace Dominic Raab as Brexit secretary. Stephen Barclay, a former banker, has been given the top job at the Department for Exiting the European Union (DExEU). He was previously minister of state at the Department of Health and Social Care. He is also a previous economic secretary to the Treasury and City minister. Barclay is a relative unknown, and his appointment was met with surprise from political commentators. The new Brexit Secretary is... Steve Barclay. No, me neither. A spokesperson for the prime minister would not be drawn on how many other MPs turned down the job before Barclay. Amber Rudd, formerly the home secretary, will replace Esther McVey at the Department of Work and Pensions. Rudd, who backed Remain in the referendum, was forced to quit the Home Office earlier this year after she admitted to “inadvertently” misleading MPs over deportation targets. Labour quickly seized on the decision. An official report later found that she was “let down” by her officials at the Home Office. Stephen Barclay, formerly a minister at the Department of Health, has been promoted to the Brexit department. On Friday, at the end of a wild week in Westminster, BuzzFeed News tracked down the man that everyone has been talking about. No, it’s not Michael Gove, it’s not Dominic Raab, and it’s not even Jacob Rees-Mogg. It’s Steve Bray, a 49-year-old self-employed numismatist (that’s a coin specialist to you and I) from South Wales. We asked Bray, who has been outside parliament with an EU flag and a megaphone all week, why and how he’s been staging his one-man protest. How do you manage to be here every day? Have you had to give up work? For the first year I was self-funded, I sold a chunk of stuff. Now people help keep me going, but I live on [the] bare minimum. I’ve been at parliament for 17 months now, every day they’re sitting. Initially I was getting a lot of abuse, mainly the black-cab drivers. I had threats on my life, things like that. You’ve got a lot of angry people who’ve voted to leave, and I say “you’ve won, get over it”, but in reality we’ve all lost. In his first public comments since Wednesday’s crunch Brexit cabinet meeting, environment secretary Michael Gove has confirmed his decision to stay in the government to “focus on getting the right deal”. He said in a statement on Friday morning: “I’ve had a very good morning in a series of meetings with my colleagues here at Defra, just making sure that we have the right policies on the environment, on farming and on fisheries for the future. Westminster is waiting to hear whether Theresa May will face a no-confidence vote. Here’s how the process works. British politics has been obsessed for the last three days with one number: 48. That represents 15% of current Conservative MPs, the threshold for triggering a vote of no confidence in the party’s leader, prime minister Theresa May. Since it emerged on Tuesday that UK government and EU officials had agreed a draft Brexit deal, there has been febrile speculation at Westminster that the magic number had been reached as furious Brexiteers and even Remainers finally lost patience in May’s leadership. But how does the process work, and what happens once 48 no-confidence letters have been submitted? 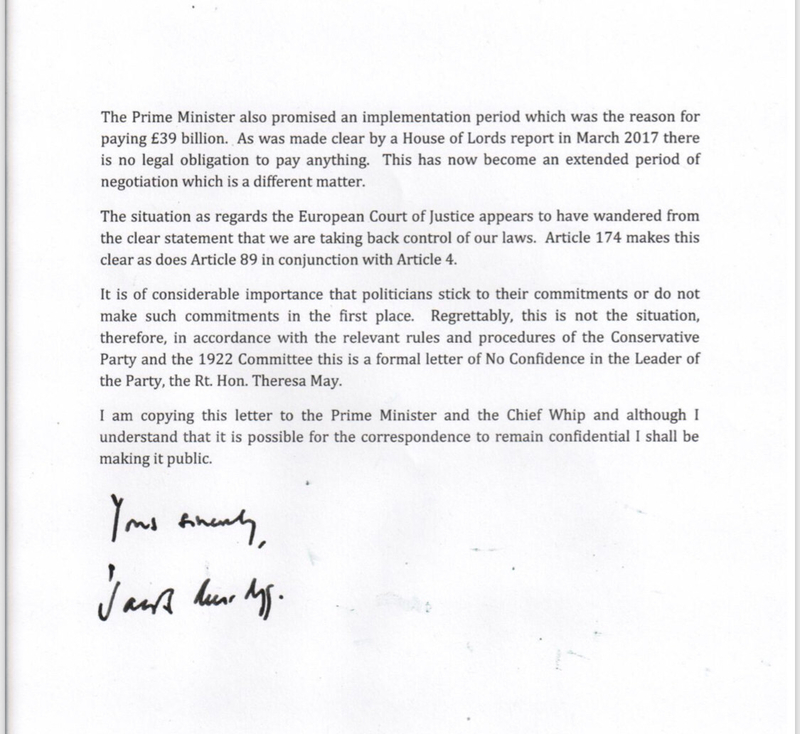 This is the mechanism for triggering a no-confidence vote: The dissenting MPs individually write letters to Sir Graham Brady, chair of the 1922 Committee, the body that represents Tory backbenchers, expressing no confidence in the prime minister. On Thursday, the leader of the hardline Tory Brexiteer European Research Group, Jacob Rees-Mogg, theatrically announced that he had submitted his letter to Brady at a packed press conference on the steps outside parliament. Brady keeps tally, and if the threshold is reached he’ll call a vote of all Tory MPs — unless Theresa May decides to resign first. Gove yesterday rejected May’s offer for him to become Brexit secretary, after the prime minister told him he would not be able to go back to Brussels to renegotiate aspects of the deal he is unhappy with. He will instead remain in his post at the Department for Environment, Food and Rural Affairs. Allies of Gove said he thought the deal was a bad one, but the alternative of no deal was worse. Gove’s decision not to quit is a significant boost for the prime minister after two Brexit-supporting cabinet ministers left her government yesterday, and the first sign that she could yet steady the ship. Downing Street hopes Gove’s assessment that the risk of no deal or no Brexit is worse than May’s deal will convince other ministers to stay in the government. International development secretary Penny Mordaunt is considering her position after Number 10 rejected her attempt to secure a free vote for the cabinet on the deal. Prime Minister Theresa May has stepped up her campaign to sell her Brexit deal to the British public, answering questions from callers on LBC Radio on Friday morning, the day after the resignation of two cabinet ministers and several other ministers over her Brexit deal. LBC’s Nick Ferrari opened the interview, asking her to confirm reports that she had offered environment secretary Michael Gove the position of Brexit secretary following the departure of Dominic Raab on Thursday. There is widespread speculation that Gove is set to resign. During the 30-minute interview, May admitted that she herself had concerns about her EU withdrawal agreement after one caller, a Conservative councillor, said sections of her deal commit the UK to a “neverending backstop”. “I know there’s a lot of concern about the backstop; I fully recognise that, and I have some of those concerns myself,” she said. “But obviously alongside that, what’s called the withdrawal agreement — the backstop is part of that — is the future relationship, the document that says: ‘Here is the basis on which we’re going to continue to cooperate with the European Union on things like coming together to deal with organised crime and terrorism, here’s the way in which we’re going to be able to continue to trade with the European Union in the future’. The prime minister also told a caller how she could be personally affected by the impact of a no-deal Brexit on medical supplies. “The Department of Health is working very, very carefully with the various companies that supply the medicines,” she said. “This is an issue that actually I feel personally. I’m a type 1 diabetic, I depend on insulin every day. As it happens, my insulin is produced by a company elsewhere in the European Union — Denmark. The discussion moved onto whether May had clashed with Arlene Foster, after reports that the DUP leader said her party is ready to withdraw support unless she steps down. “I haven’t had a testy exchange with Arlene on that. We’ve had exchanges with the DUP about the issue in relation to Northern Ireland. They’ve raised some questions with us, they’ve raised some concerns with us, and, yes, we’re looking at those. One of the issues is what can we do in the UK — ourselves, nothing to do with the deal with the EU — to help reassure not just the DUP, but the people of Northern Ireland,” the prime minister said. But the prime minister stumbled when asked whether the cabinet will have a free vote on the deal. “There is cabinet collective responsibility in this country; government policy is government policy,” she said. The final caller accused May of “appeasing” Europe and locking the UK into its rules, asking her whether she considers herself a “modern-day Chamberlain”. “No I don’t. We’re not going to be locked in forever to something that we don’t want,” she replied. Invited journalists initially thought the prime minister might be announcing her departure. Her speech opened with the words: "Serving in high office is an honour and privilege. It is also a heavy responsibility. That is true at any time — but especially when the stakes are so high." However, she went on to reiterate her commitment to seeing the Brexit process through and ensuring the UK leaves the EU on March 29 next year. "My approach throughout has been to put the national interest first. Not a partisan interest. And certainly not my own political interest," she said. "I do not judge harshly those of my colleagues who seek to do the same but who reach a different conclusion. They must do what they believe to be right, just as I do. "I am sorry that they have chosen to leave the government and I thank them for their service. But I believe with every fibre of my being that the course I have set out is the right one for our country and all our people." Asked repeatedly whether she would fight a no-confidence vote from her own MPs, May said she was "determined to see this through". Answering a question from BuzzFeed News, May said she did not regret calling a snap general election last year, despite her reduced minority and the difficulty she is likely to face in getting the deal through parliament. Despite her predicament, after a day of government resignations, May was able to joke with reporters when she mistook one member of the press pack for another. And when a reporter used a cricket metaphor — asking whether she would score the required runs to win the match — May replied that one of her cricketing heroes was Geoffrey Boycott, the stoic Yorkshire and England batsman famed for staying at the crease for days on end, scoring slowly but surely. "Geoffrey Boycott stuck to it and he got the runs in the end," she said. Chishti said May’s Brexit deal was contrary to the Tories’ manifesto commitments and delivered a withering assessment of the government’s actions over the case of Asia Bibi, the woman seeking asylum in the UK after threats to her life in Pakistan. He said it was “shocking” that the government was “failing to put into practice the core values our country stands for” by not offering Bibi asylum. And just days earlier, transport minister Jo Johnson resigned and called for a second Brexit referendum. The prominent Eurosceptic backbench MP told dozens of gathered reporters: "You've got to do what has to be done. I campaigned on Brexit, I stood on a manifesto promising Brexit, the prime minister is not doing that, the conclusion just follows." Rees-Mogg said he would not be putting forward his own name as potential leadership candidate, but said there were several potential candidates within the party, such as Boris Johnson. His press conference was partially drowned out by protesters opposite shouting "Stop Brexit!" Ahead of Rees-Mogg's appearance, foreign office minister Alistair Burt, who was a supporter of the Remain campaign, told reporters that he felt that May was still the right person to lead the Conservative Party. "My plea for colleagues would be 'stick with this'," he told reporters. "As someone who voted to stay in the European Union, who wanted to stay in the union, has compromised... I've worked very hard with colleagues over the last two years to help the prime minister achieve this. I think they have to do to their bit of compromise as well, otherwise I think it'll lead to an abyss." Brexit minister Steve Baker said he had submitted a letter to Brady three weeks ago, but only made the document public this afternoon. "It became clear to me on 22 October that Theresa May would not be able to negotiate a Brexit worth delivering," he said. Prime Minister Theresa May leaves 10 Downing Street, London, for the House of Commons to make a statement on the draft Brexit withdrawal agreement. A Downing Street spokesperson said Theresa May would fight a no confidence vote should MPs rally against her. The spokesperson said that May still expected to be prime minister when Britain leaves the EU, and that she still anticipated the next general election to come in 2022 as planned. In the wake of Thursday's ministerial resignations, the spokesperson said: "We're having to confront some very difficult issues and she doesn't shy away from that. "Obviously given the difficulty of those issues she respects the integrity of her colleagues and thanks those who have resigned for their service." He told Theresa May: “I cannot agree, in the cold light of day, that the deal in front of us today is right for our country. It does not deliver a good and fair Brexit”. Jacob Rees-Mogg MP speaks at a Leave Means Leave event in October. In a dramatic intervention in the House of Commons this morning, Rees-Mogg told Theresa May: “What my right honourable friend says and what she does no longer match,” asking her to give him a reason not to write a letter. Rees-Mogg’s decision will likely cause a flood of further letters from members of his European Research Group of Conservative MPs. 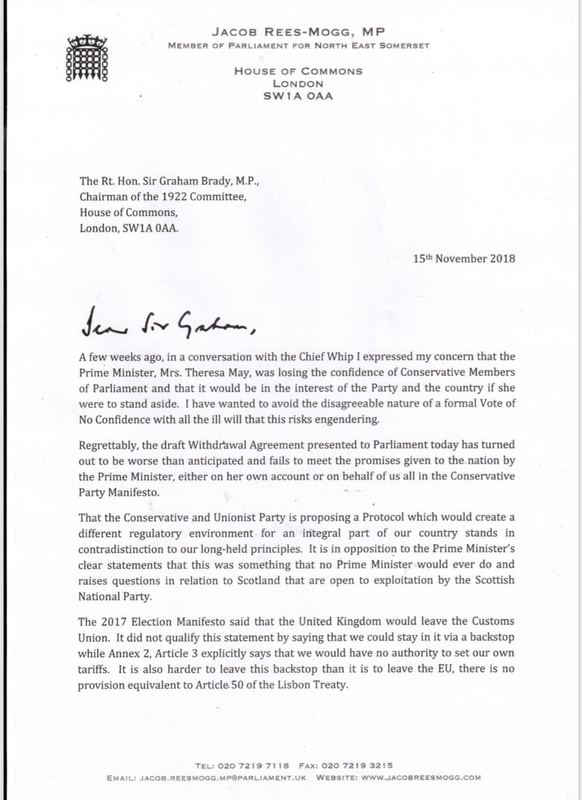 If 48 Tory MPs send letters to Graham Brady, the chairman of the 1922 Committee of backbench Conservatives, Brady will inform Theresa May that vote on her future must take place “as soon as possible in the circumstances”. May must then secure the support of a majority of Tory MPs to win a confidence vote. If she does she remains in place and cannot be challenged for another year. If she does not then she must resign. Labour party leader Jeremy Corbyn speaks in the House of Commons, London, following Prime Minister Theresa May's statement on the draft Brexit withdrawal agreement. Labour MPs told BuzzFeed News that morale is generally high on the opposition benches, as the party continues to push for another general election — which some think could be a reality in the near future. Labour MP Afzal Khan told BuzzFeed News: “The government is collapsing around us. Ministers are resigning by the minute. Theresa May has lost all authority and control over this process. Another MP said: "We are witnessing a government collapsing before our eyes with Raab and others putting self-interest before our country. "Morale amongst Labour MPs is good. We will press what is left of this government every step of the way. We are ready for a general election." A third MP added: “The mood seems to be one of bemusement and uncertainty. Watching ministers resign one after the other shows how divided the government is. In a statement, Jon Trickett MP, Labour’s shadow cabinet officer minister, said: “The government is falling apart before our eyes as for a second time the Brexit secretary has refused to back the Prime Minister's Brexit plan. This so-called deal has unravelled before our eyes. "This is the twentieth minister to resign from Theresa May’s government in her two-year premiership. Theresa May has no authority left and is clearly incapable of delivering a Brexit deal that commands even the support of her cabinet — let alone Parliament and the people of our country." EU chief Brexit negotiator Michel Barnier (left) hands over a draft Brexit withdrawal agreement to the European Council president Donald Tusk. Two senior officials wondered whether May would still be prime minister next week. One official pondered on the uselessness of the splits within her cabinet, and party. “It is just pointless bloodshed,” the official said. “[It would be] funny if it wasn’t so tragic,” they added. Regardless of May’s personal political fortunes, officials are sceptical that the agreement will win the backing of MPs to make it through parliament, which would make the planned meeting of EU leaders to sign off on the deal, redundant. A defiant Theresa May told MPs on Thursday morning that she had defied critics who said the UK would be treated as any other third-party nation in negotiations with the EU. She pointed to bespoke agreements on customs, security collaboration and a time-limited "backstop" insurance policy on the Northern Ireland border, should a future trade deal not preserve the soft border with the Republic of Ireland. "It is a draft treaty that means we will leave the EU in a smooth and orderly way on 29 March 2019 and which sets the framework for a future relationship that delivers in our national interest," she said. No other nation, May said, has an arrangement with the EU as detailed and advanced as this. But she was jeered by pro-European MPs on declaring that the withdrawal would be "smooth", having lost two senior cabinet ministers in the previous two hours. Referring to the departure of Dominic Raab and Esther McVey, May said: "Delivering Brexit involves different choices for all of us. We do not agree on all the choices but I respect their views and would like to thank them sincerely for all the work they have done." In response to the several other pro-Brexit outriders in her own party, she said it was not possible to scrap the Northern Ireland backstop, warning: "There is no deal which delivers the Brexit the British people voted for which does not involve this insurance policy." The EU would not countenance, she added, any deal that didn't have this clause. And scrapping it would go back on promises made to voters in Northern Ireland. "We can choose to leave with no deal, we can choose no Brexit at all, or we can choose to unite and support the best deal that can be negotiated," May said. She had to pause while the cheers subsided at her mention of Brexit possibly being stopped. In response, Labour leader Jeremy Corbyn said the deal was "botched", broke May's own red lines and did not meet Labour's six tests, which would determine whether the party would back the agreement. "The government is in chaos. Their agreement risks leaving the country in an indefinite half-way house without a real say," he said. Conservative party handout picture of Brexit Minister Suella Braverman. She said “the proposed Northern Ireland backstop is not Brexit,” telling the PM in a resignation letter: “I have reached a point where I feel that these concessions do not respect the will of the people”. Anne-Marie Trevelyan has also resigned her post as parliamentary private secretary at the department for education. Work and Pensions Secretary Esther McVey leaves her home in London Thursday morning. In her letter to Theresa May, she said: “The deal you put before cabinet today does not honour the result of the referendum." McVey accused the PM of not being honest with voters. “The British people have always been ahead of politicians on this issue, and it will be no good trying to pretend to them that this deal honours the result of the referendum when it is obvious to everyone it doesn’t”. “We have gone from no deal is better than a bad deal to any deal is better than no deal,” she said. Pro-EU demonstrators gather outside the gates of Downing Street waving flags and holding placards, London on Nov. 14. At around 10am the EU's chief negotiator, Michel Barnier will meet European Parliament President Antonio Tajani and representatives of the main EU political groups to discuss the agreement. Irish Taoiseach Leo Varadkar is expected to brief Northern Irish parties — including Sinn Fein, the Alliance Party, SDLP, Northern Irish Green Party — on Thursday morning on the draft Brexit agreement. The DUP has indicated it would vote against the agreement. In a letter to the prime minister on Thursday morning, Raab said her agreement with Brussels breached the Conservative party manifesto, threatened the union and gave the EU a “veto” over the UK’s ability to exit the backstop arrangement. “This is, at its heart, a matter of public trust,” he told the PM, concluding: “I cannot reconcile the terms of the proposed deal with the promises we made to the country in our manifesto at the last election”. Raab said: “I believe that the regulatory regime proposed for Northern Ireland presents a very real threat to the integrity of the United Kingdom”. “I cannot support an indefinite backstop arrangement, where the EU holds a veto over our ability to exit,” he wrote.